Bitdefender presented the all new Security program designed specifically for Windows 8. This antivirus consist of pretty nice features like proactive scan app, easy start protection, Scan Boost and safety information. According to the users it is one of the best solution for Internet threats and remarkably doing great job specially with the new OS : Windows 8. You can enjoy the whole internet without any threat with real-time security anytime. 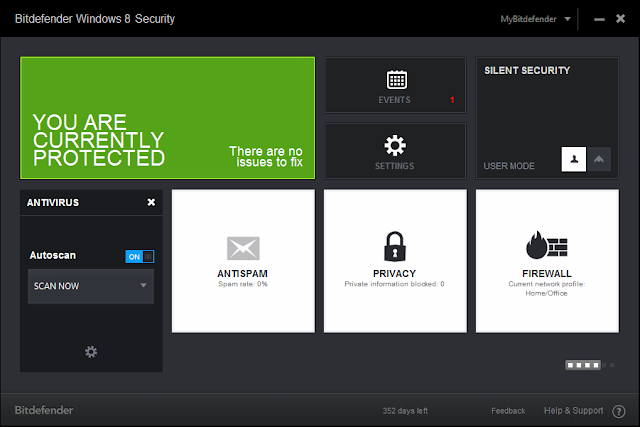 The all new dashboard will help you to manage your security from any Internet device. Like previous versions of Security programs this all new antivirus for Windows 8 also came with really important features which can enhance the safety of your Windows. It will protect your Windows from unwanted malicious threats while using Windows on Early-Launch Anti-Malware (ELAM) technology. It gives you the important information about the security of your OS at start-up. It is the automatic program which will analyze your Windows applications and quickly notify you when there is any kind of problem with your installed applications which can create a risk. The title says all. Yes it comes with High-Speed scanning which helps you to keep your work going while scanning the whole system. The developers made the program more Windows friendly which helps it easily to integrate with your Windows 8. Also keeps you updated with the protection status of your Computer. Dual Firewall : It comes with dual firewall technology which keeps your Internet and your WiFi connection protected. Safe Search : This program will warn you if you are accessing any kind of suspicious and dangerous sites in your Search engine. Phishing : Prevent from Bad Sites which can notify your Bank and Credit Card Information. Active Control : Easy monitored process to catch threats and viruses. Antispam : Blocks Junk mails and Spam messages. Parental Control : Easily control and manage your children online activity. You can easily Block the websites which consist of inappropriate content for children. Also helps in monitoring Bad content from Social Sites too. Autopilot : Yes the name says all. You can Watch movies, play games or work on your projects without any notification which create interruption. This is one of the best feature liked by many users. Also there are more add-on features like Vulnerability Scan and USB Immunizer which can helps you to get more protection while Search. You can access the official site for more brief info about these features. If you liked the program then get your Copy of Bitdefender Security for Windows. It is now available on the official site or you can try it as a Trial too.